This entry was posted on Saturday, December 15th, 2018 at 7:30 am and is filed under Uncategorized. You can follow any responses to this entry through the RSS 2.0 feed. You can leave a response, or trackback from your own site. 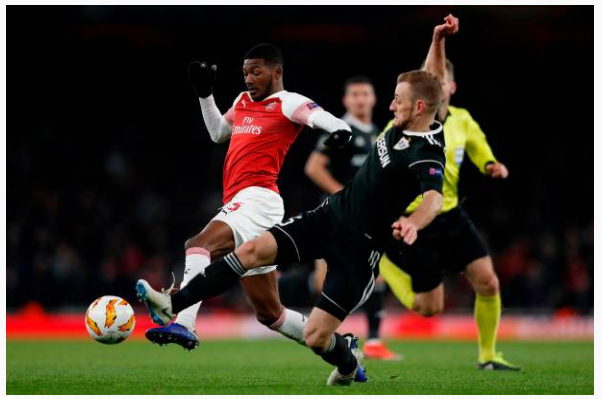 34 Responses to Alternative Qarabag – exciting prospects give us a glimpse of the future? Almost made me wish I’d stayed up for the second half! Tried to put the snow on the site but the arseholes have removed it as an option, presumably you have to pay for it now! LB thank you, from one who was there, for your intriguing observations. 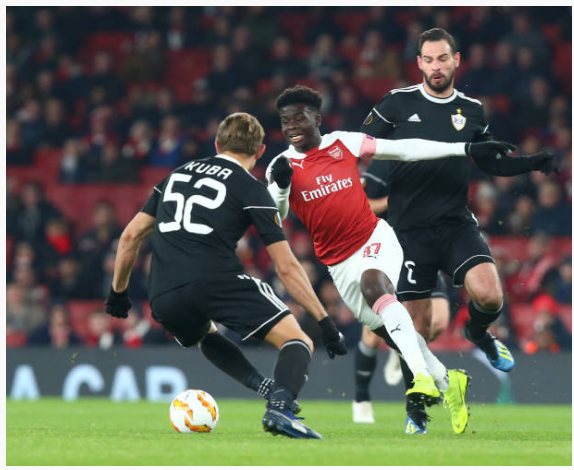 The confidence to take wide defenders on was eventually evident from Saka by the end of the game, and that has to be praised. I think a further reason for my frustrated comment immediately after the game was because Carrier Bag were a poor team from the start, if prepared to run hard and play 11 behind the ball, and I hoped the youngsters would “take them on from the start. Too much went back and across, through Elneny, in the first half, without creativity. I would have put Ouzi on quite early on and got his energy to galvanize youthful talent, myself. Lastly, and back on my hobby horse, I think A MN is wasted wide. His best efforts on Thurs for me were when he came inside and took the ball at speed centrally to attack the heart of the opposition. That’s where I want to see him make his mark. Good to share views with a fellow Eskimo masochist! Excellent title and pics again Chas but what I aways like are the tweeks, I enjoy sitting back and thinking, ohh, that is how you do it. Ha, I think I added three commas! The thing that struck me LBG as I was looking at your line ups was that no matter which way you cut it Medley has to be on the bench and that could turn out to be interesting. I think Emery will go for belt and braces again. Agree ‘re Medley, LB, but, at risk of repeating, think Thompson is as good potentially. Is he injured? That really is worth a watch. I couldn’t recommend it more strongly. What a magnificent video. Piviledged to have been there to see his return on Thursday. Legend of a man, legend of a sportsman, legend of an Arsenal player. Hey LB, you’ll like this suggestion from the London Metro paper for a line up tomorrow! Wouldn’t argue too much with that to start, except would start with Mesut, if fit, then hit them with Laca and Micki after 60mins. That was a positive post LB! Enjoy the emphasis on what they Arsenal have as opposed to just buying the talent of entire countries. Some solid talent there, and with Freddie and Per overseeing their arcs, you can say I am one happy guy. 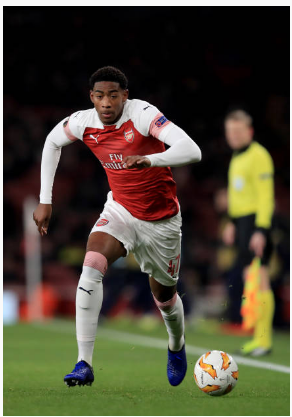 AMN central please, and want to see Mavro healed up and ready to play. Conundrum on who starts center, maybe Nacho, but not sure if Kos can handle 2 games in a row. Seem to remember achilles surgeries taking 9-12 months to fully rehab, but then again maybe super Kos has some Kobe like DNA. Thoughts AAers on Denis Suarez from Barca for surely a miseryly £12m and/or Cengiz Under from Roma for a lot more? I cycle around Richmond Park on a regular basis and shouting Fenton is pretty much everyones running joke — including mine. Did Koscielny really play a game of football on Thursday; he probably had more of a challenging run out during the half an hour he was on the pitch in the recent under 23 game. He will surely start tomorrow, although, I would be surprised if he started against spuds in the week. So maybe that will give Medley a chance? Sounds like a question for RC, I can’t comment as I don’t know them. The Kos vid is inspiring. Spurs fluke another extra time win. They are becoming the new MU. Sound effects would be him chuckling! Only in the first shot of this goal do you see how Mesut starts moving into the exact spot where the ball is going to land even before it’s headed. Medley sings his first team initiation song at Southampton hotel. I wonder LB are you the new Arsenal soothsayer?